Ford India recently launched its stylish, powerful and connected EcoSport in Nov 2017. The new EcoSport has been comprehensively redesigned with more than 1,600 new parts, featuring rugged new looks, sleek interior makeover, a raft of ingenious technologies and a new engine, offering more power & efficiency. Stylish look compromises with well-defined Exterior & Interior. LED Daytime Running Lamps, Refreshed Grille, 205/50 r17 Alloy Wheels, Automatic Headlamps, 20+ storage compartments, 6 Airbags all-around, Staying connected with Apple CarPlay and Android Auto, Smart Space, Automatic Transmission with all these Exterior & Interior features and technology, the All-new Ford Ecosport marks a milestone. In addition to a five-speed manual transmission, Ford is also offering the petrol engine with an all-new six-speed automatic transmission that offers smooth, precise shifts across all powertrain options. 2018 New EcoSport will also be offered with Ford’s trusted and reliable 1.5L TDCi diesel engine that delivers best-in-class 100 PS power and fuel efficiency of 23 Km/L. Maximum safety is ensured with the compact that has been built strong using high-strength steel and will feature a host of safety features including Emergency Brake Assist, Traction Control System, Impact absorbing door panels and Steering Wheel among others. Let us now look at 2018 Ford EcoSport distinct Color variants. Check out the Ford EcoSport in the Lightning Blue Color variant which gives the spark and energetic feel among five Ford EcoSport 2018 Colors. Above is the photo of 2018 Ecosport in Lightning Blue Color Variant. New 2018 ford EcoSport is made available in Blue Color (Lightning Blue). For the adventurous freak, here you go! Ford EcoSport in the Race Red Color variant. Above is the photo of 2018 Ecosport in Race Red Color Variant. New 2018 Ford EcoSport is made available in Red Color (Race Red). Here the Ecosport’s unique color variant “Canyon Ridge”. Ford EcoSport in the Canyon Ridge Color variant for stunning look and feel. Above is the photo of 2018 Ecosport in Canyon Ridge Color Variant. New 2018 Ford EcoSport is made available in Canyon Ridge. 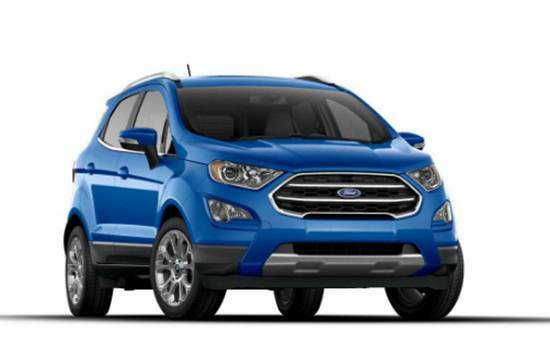 Get New Ford EcoSport for Test Drive! Provide your details so that we can arrange a test drive of New Ford EcoSport for you at your city!